My name is Simon. I’m 10 years old. I’m a serial killer. Robert Stern (Rupert Penry-Jones), a successful defense attorney, doesn’t know what lies in store for him when he agrees to meet a new client in a derelict estate on the outskirts of Berlin. 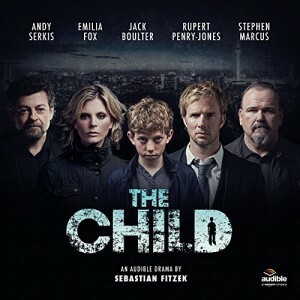 Stern is more than surprised, when his old love interest and professional nurse Carina (Emilia Fox) presents him a ten year old boy as his new client: Simon (Jack Boulter), a terminally ill child, who is convinced he has murdered many men in a previous life. This is a really good thriller. It’s psychological, suspenseful, and… yes, creepy. The performances are superb from everyone in the cast (and such an excellent cast!). Penry-Jones and Serkis were particular standouts for me. The sound effects are well-balanced, very rarely threatening to overwhelm the actors’ lines (there is a moment early on, in the rain, although that was actually kind of realistic), and there is one voice that is slightly scrambled (on purpose) which wasn’t always clear. I’m keeping this review very short because I don’t want to spoil any of the story — also, it’s out today, and I wanted it up in a timely manner. The story is not written with a breakneck pace — in fact, it’s quite a slow-burn. There are some genre tropes ticked off, but it doesn’t come across as a paint-by-numbers thriller. There are suggestions of something supernatural and/or otherworldly from early on, and it takes some time for things to be unveiled. If you’re looking for something chilling to listen to in these cold(er) winter months, then I would absolutely recommend The Child.